New and Used Metal Gondola in Tampa! Metal Gondola Shelving is another popular and multi-functional merchandising solution for any space. Island gondolas can be used as free standing units or to create a run with starters and add-ons. Our new Gondola shelving is heavy-duty with tan or black powder-coated finish. Metal Shelves & either a peg board or solid back offer flexible merchandising options. 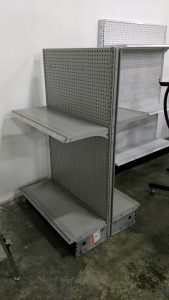 Gondola shelving is a popular system for every pharmacy, super market, grocery, convenience store, hardware store, discount store, liquor store, pawn shop, pet shop, and many more. A Starter Unit is complete with 2 uprights, base shoe covers & end trim pieces. This unit can work as a free standing display or as the beginning section to a run. An Add-On unit comes with a single upright and is used to connect sections to create a run. Gondolas are made with heavy duty steel to accommodate heavy loads. The built in levelers and snap together parts make assembly quick and easy. 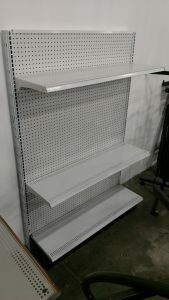 We have a variety of used metal gondola shelving in stock as well! Photos below are just a sample of our current inventory. Please give us a call and we can help you get the units you need.